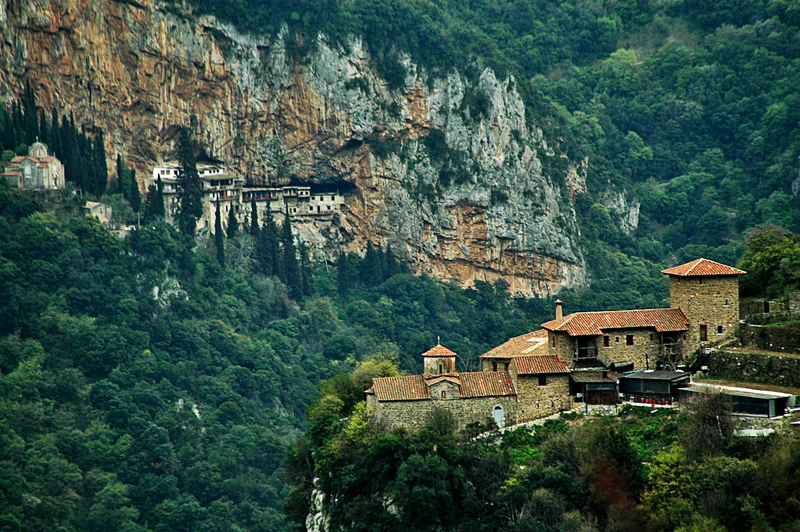 The history of present-day Gortynia begins with the founding of the Filosofou Monastery (Monastery of the Philosopher), which is also known as “The Lady of the Gorge”, since it dominates the most beautiful section of the gorge (Monopori), on the western side of the Lousios, 11km south-west of Dimitsana and around 86km from Tripoli. 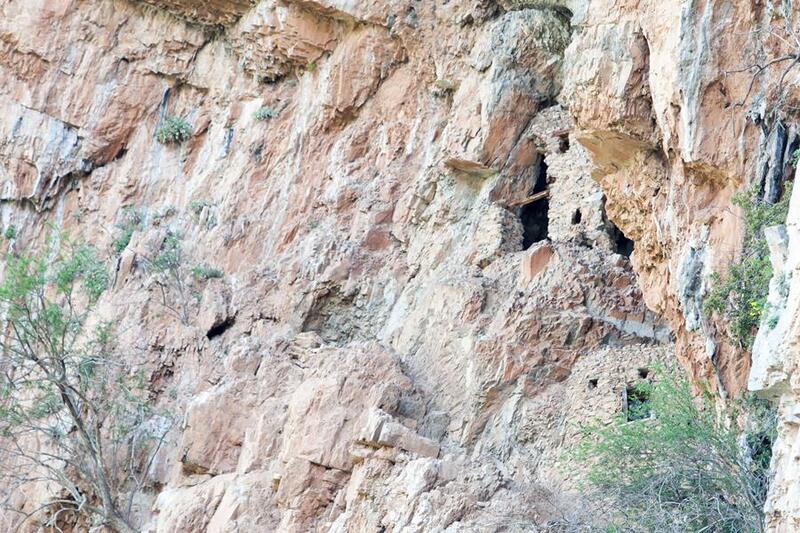 At Monopori there used to be caves inhabited by ascetics, which were destroyed by the Slav invasions in the 7th and 8th centuries. 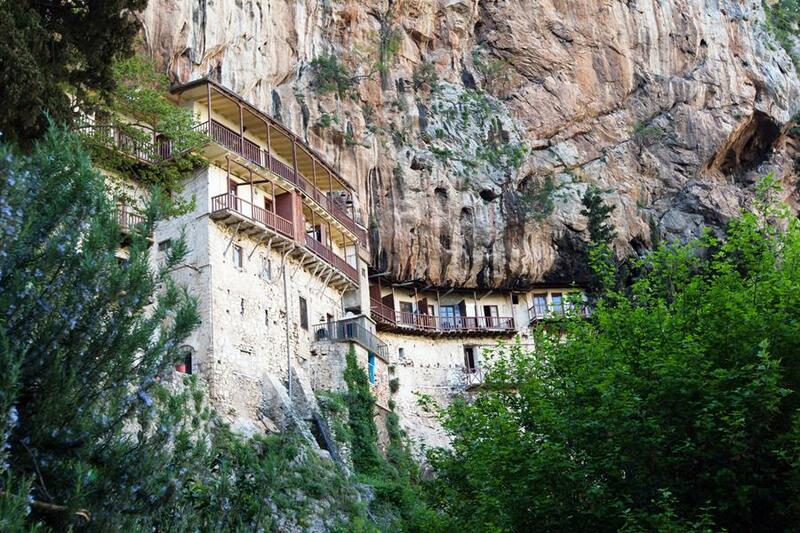 The monastery is dedicated to the Dormition of the Virgin and its feast day is on the 23rd of August. 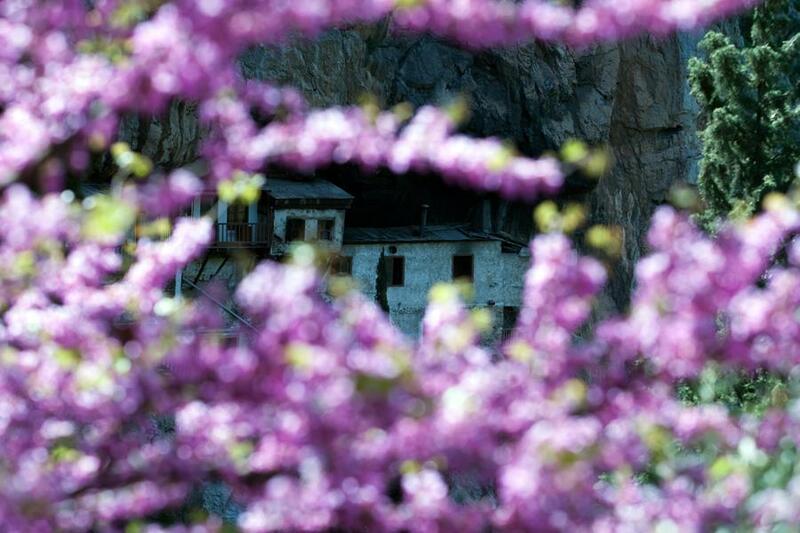 It is made up of two groups of buildings: the old monastery, which according to folk tradition also bears the name “Krifo Scholio” (“Secret School”), and the new. Both of them are located on the right shore of the Lousious and are about 500m apart. 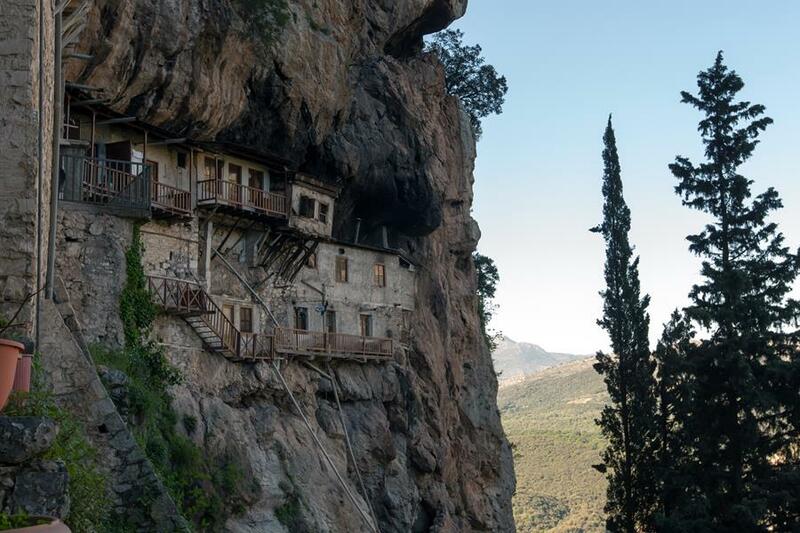 The old Filosofou Monastery is the most historic and the oldest monastery in Arcadia, and represents one of the most ancient Byzantine monuments that exists in Greece. It was founded in 963 during the reign of Nikephoros Fokas by Ioannis Lambardopoulos of Dimitsana, the eponymous “philosopher”, who served as secretary (“Protokritis”) of the emperor. The monastery took its name from his nickname. 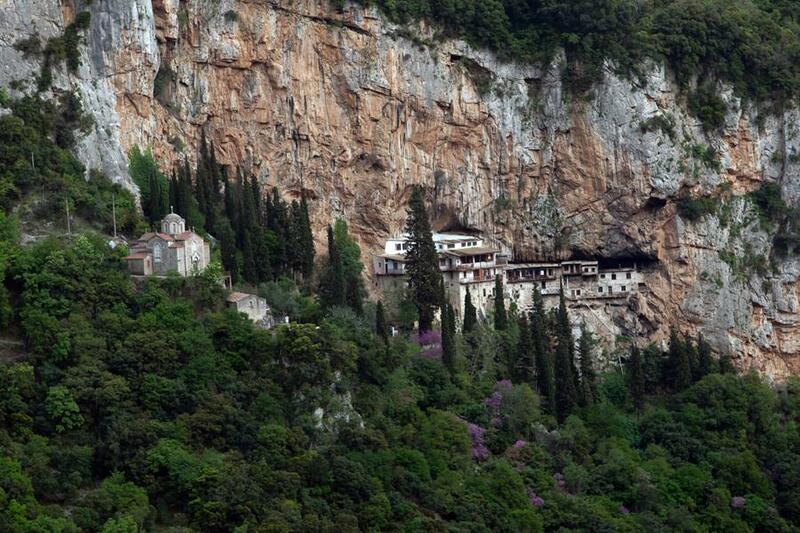 It is a stavropegic monastery (i.e. directly subordinated to the Patriarchate). 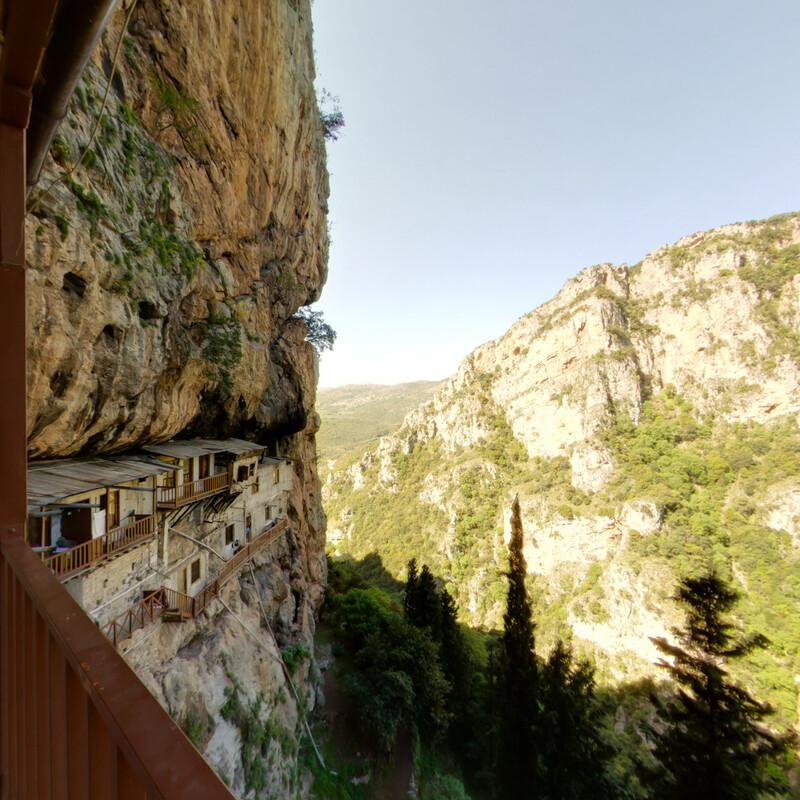 Shaped within a natural cave 128 metres long and 0.6-8m wide, at the foot of a sheer cliff, and about 200 metres above the bed of the Lousios river, the monastery is at an elevation of about 500m. Imposing and rugged, the landscape spreads out beneath it to the bed of the river. 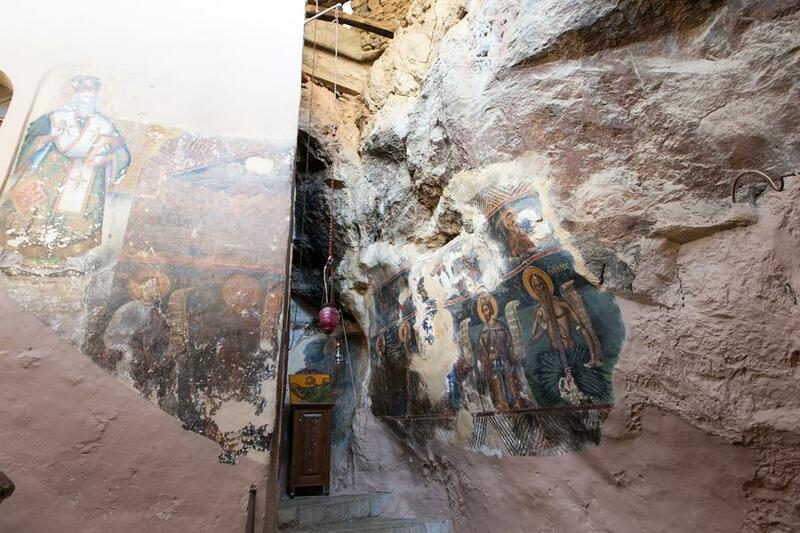 The only surviving building of 10th century Byzantine craftsmanship is a small chapel, with notable frescoes. It is a cross-in-square church with an octagonal dome. From the rest of the monastery only ruins of cells and other dwellings are preserved, along with a cistern. In the old monastery, also known as “Krifo Scholio”, Greeks were taught during the years of the Turkish Occupation, while later it developed into a large theological college which also operated in the New Monastery and from where a large number of teachers, priests, monks, higher clergymen as well as leading prelates of the Church graduated. 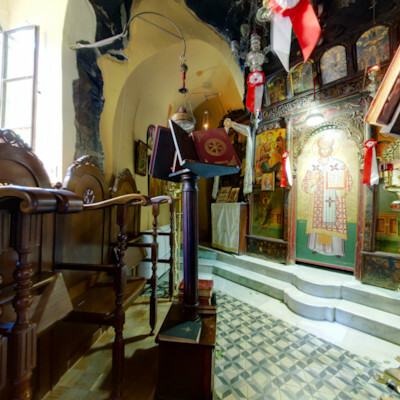 Four patriarchs of Jerusalem came from here, two Ecumenical Patriarchs of Constantinople and many of the highest clergymen (Gregory the 5th, Germanos III of Old Patras). 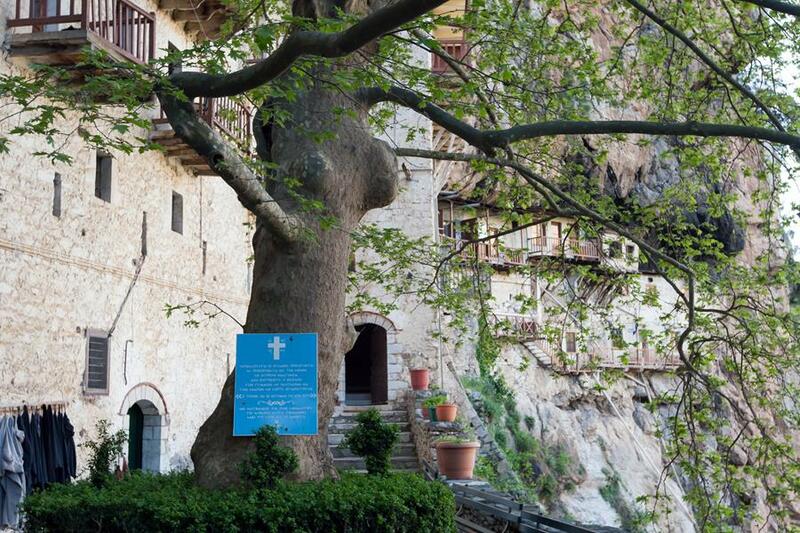 The few written testimonies that have been preserved come from the archive of the monastery, which is kept in the library of Dimitsana. 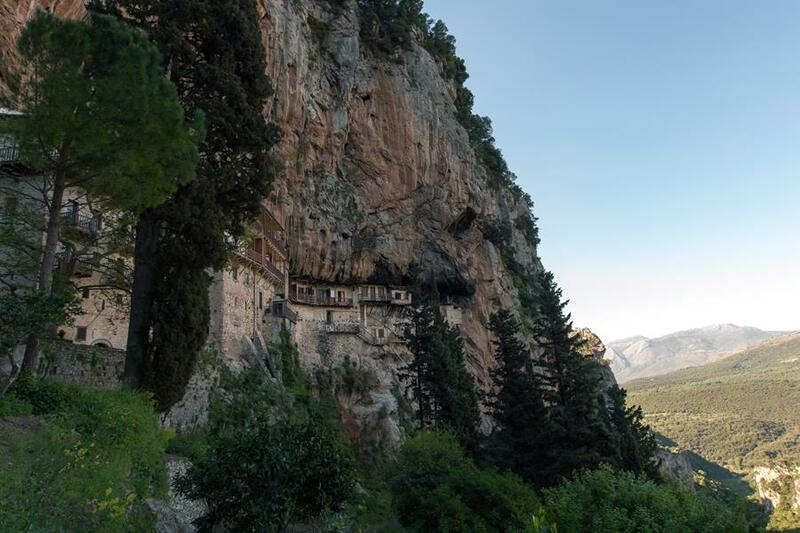 The monastery used to maintain a library with important manuscripts from the 12th century, several of which are kept in the National Library of Athens. 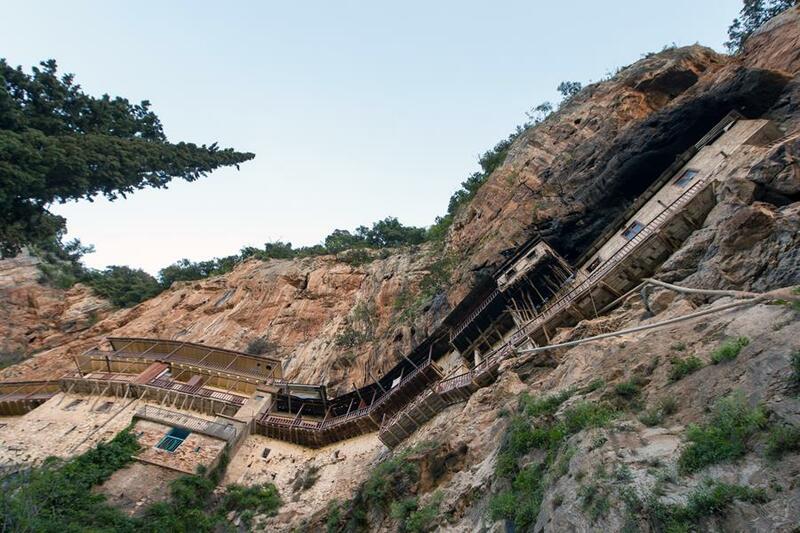 The new monastery is built around 500m to the north of the old, on the top of a cliff, at a height of 550m, and on smoother ground than the old monastery, to which it is the successor, according to historical sources. Research, therefore, concludes that the basic reason for the founding of the new monastery was the difficulty of access of the old. 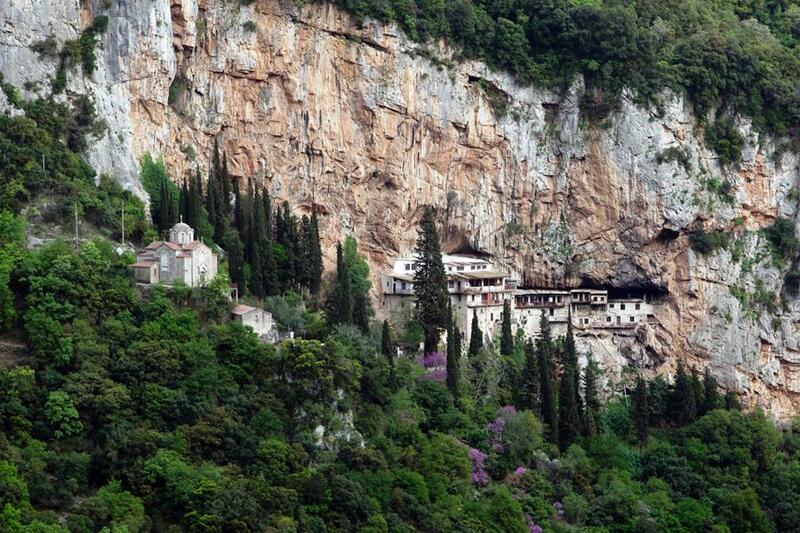 The new Filosofou Monastery was founded after the middle of the 17th century, and it was already in operation by 1691. Its central church was built first (1661) and thereafter several cells, without, however, the old monastery being abandoned. 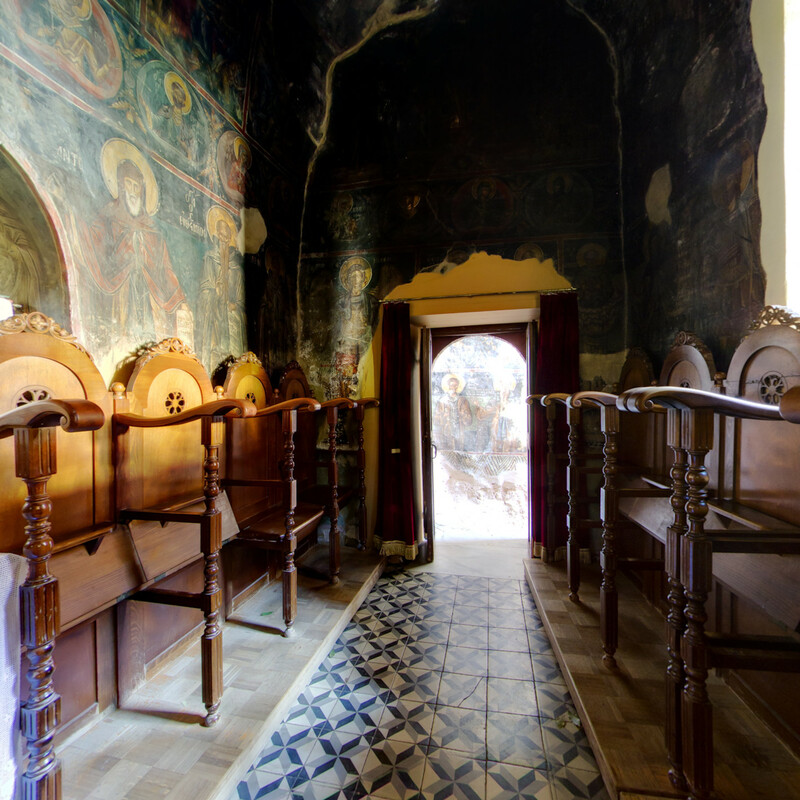 The iconostasis of the central church is carved in wood with elaborate ornamentation and bears icons of Cretan craftsmanship, attributed to the painter Victoras (1663). 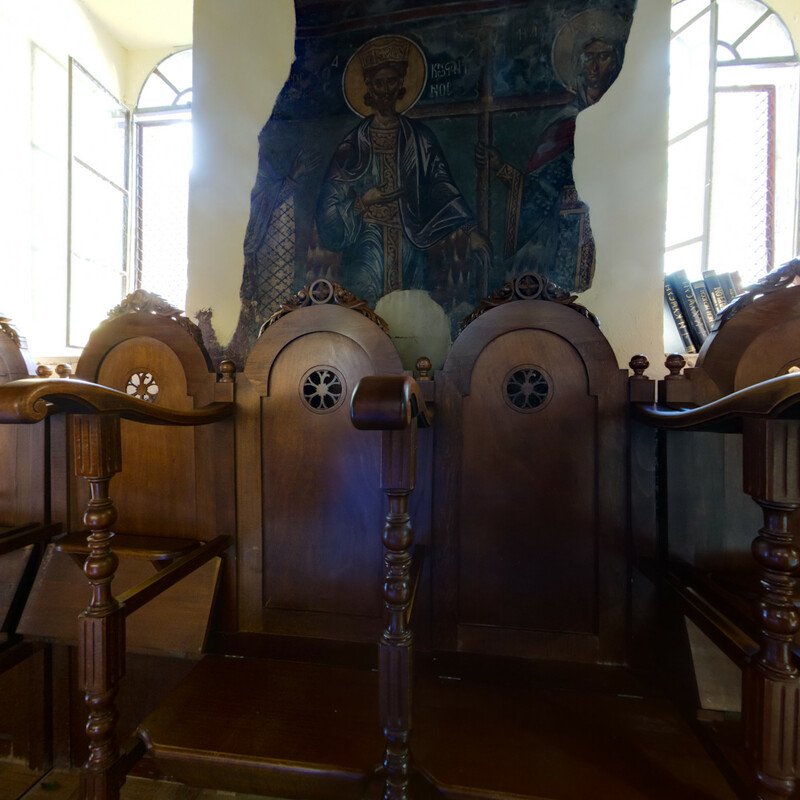 The icons on the church walls were painted in 1693 at the expense of “Mavraidis-pasha Farmakis” from Stemnitsa, who, though he had converted to Islam, went over to Christianity during the Venetian Rule. He is depicted on the western side of the church, in the guise of a typical Oriental, with a sullen temperament, luxurious clothing and a komboloi (rosary), right next to the icon of St. Helen. 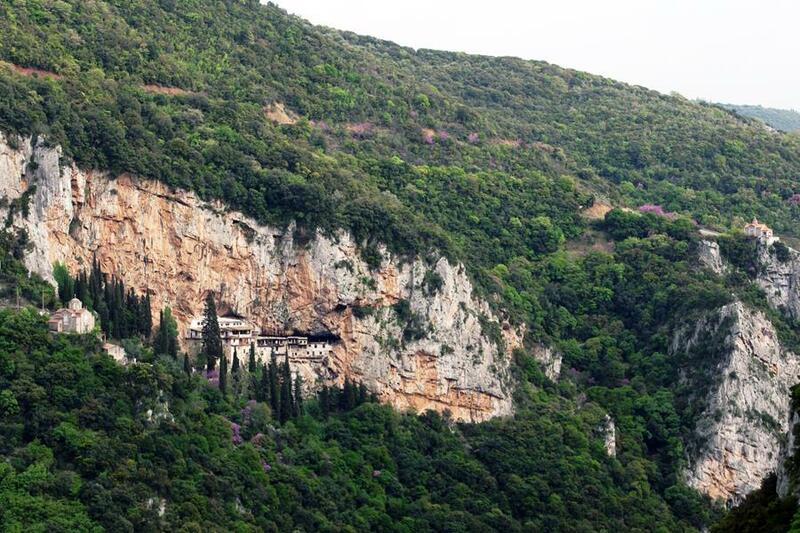 It is likely that the new monastery was founded originally as a dependency of the old, thanks to its economic strength and the increase in the number of monks. Later, however, the old monastery was gradually relocated there and in time was definitively abandoned. Between the years 1834-1836 the monastery was dissolved by command of the Bavarian Regency, the reason being that it had fewer than six monks. 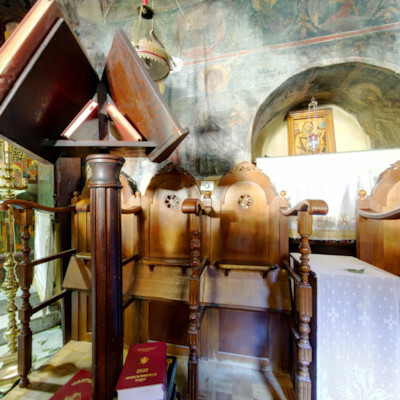 All its assets (sacred books, codices, equipment, the relics of St. Athanasios of Christianopoulos etc.) were moved by care of a special committee to Dimitsana. In 1838, by decree of King Otto, it was given leave to function again and all its assets were restored. 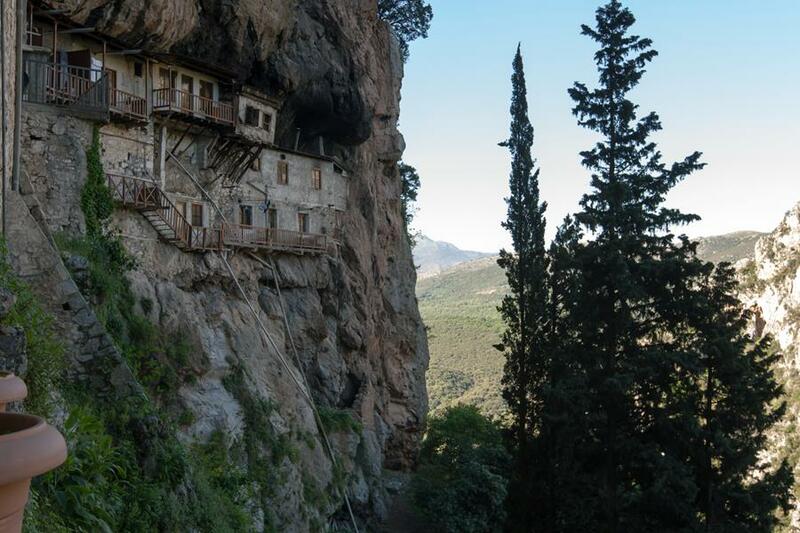 In 1948 the Very Reverend Archimandrite Father Theoktistos Alexopoulos became abbot. During his time important works were carried out, with the help of the tireless monks of the monastery, to the benefit of its smooth operation. In 1955 it was characterised as a heritage site and from 1992 has undergone renovation under the supervision of the Ministry of Culture. 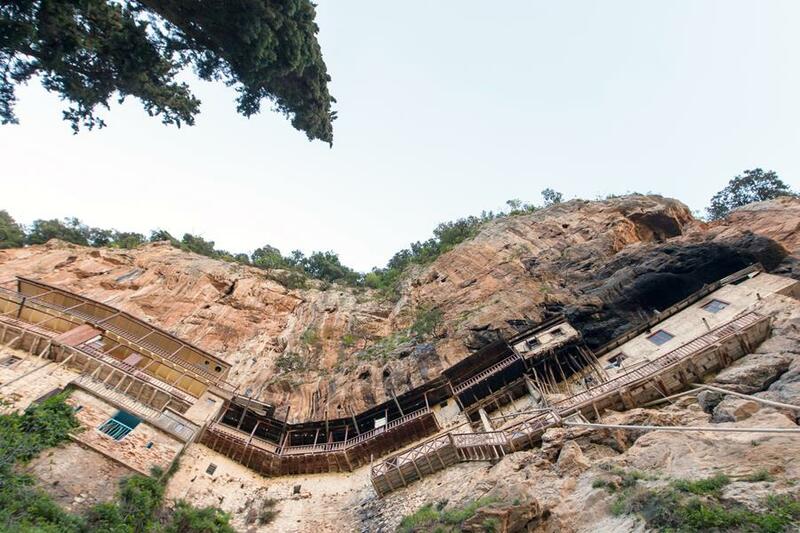 Thanks to funds allocated to the plan for regional development in the Peloponnese, the directorate for the restoration of Byzantine and Post-Byzantine monuments took the initiative both of carrying out the necessary study and of implementing the work. 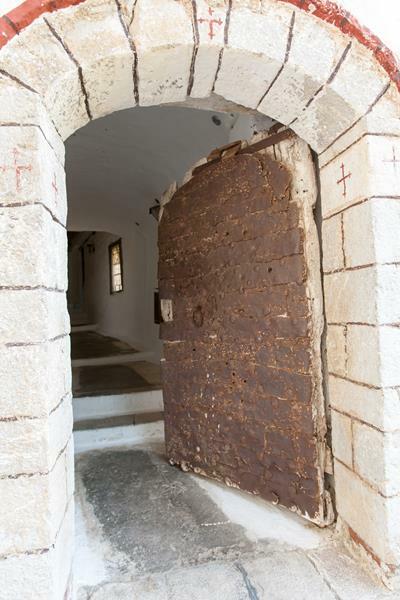 Already restoration and consolidation work has been carried out on the monks’ cells, to the south-west of the central church, as well as the creation of pavements to access the monastery. Recently restoration and consolidation work has been approved and scheduled for the north wing of the cells and the central church. 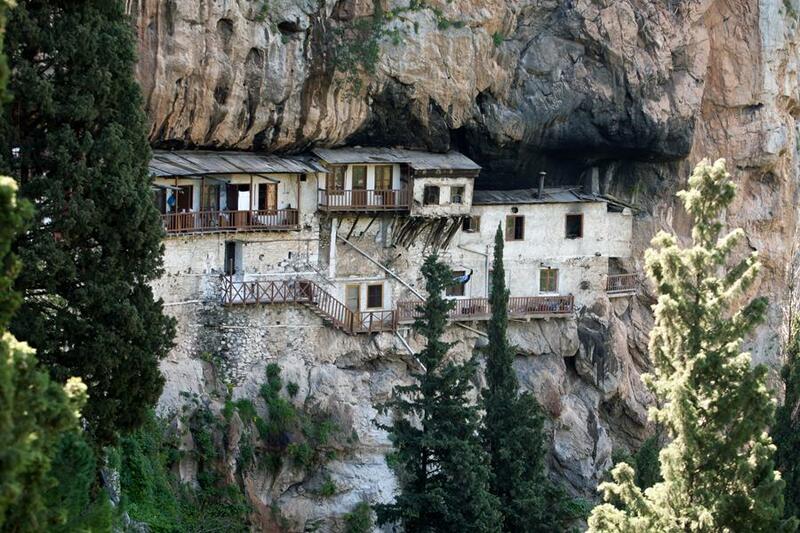 In 2008 Archimandrite Father Leontios Theodoropoulos, hailing from Elliniko, became abbot. 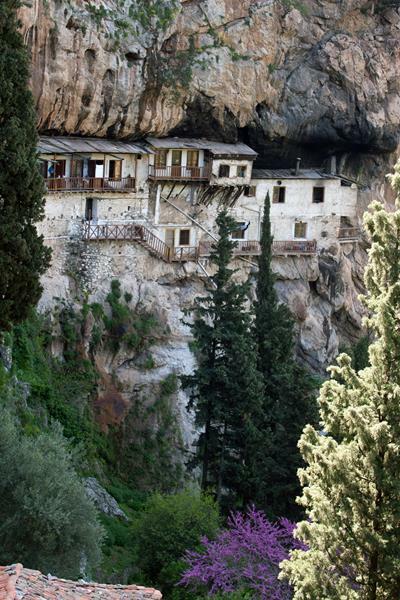 The visitor can access the monastery from two points, and only by foot. The main road with cars reaches the church of the Transfiguration. 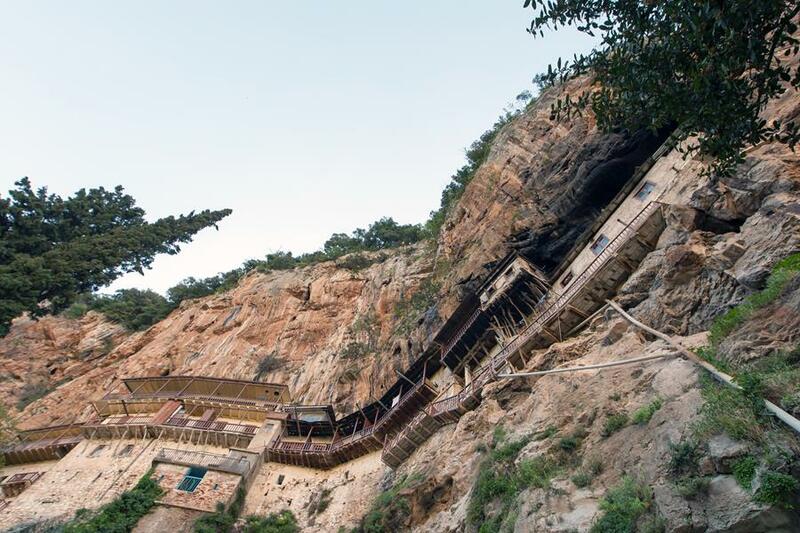 From there a path of around 800m leads to the monastery , which juts out almost in mid air, hanging onto a steep cliff. 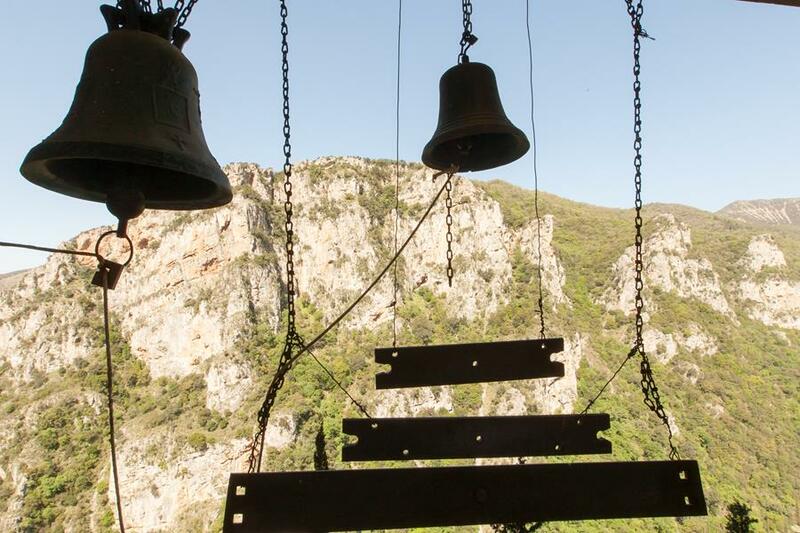 The second route is longer but ideal for those who like walking – it starts from the Filosofou monastery and reaches the monastery after crossing the Lousios via specially created footpaths. 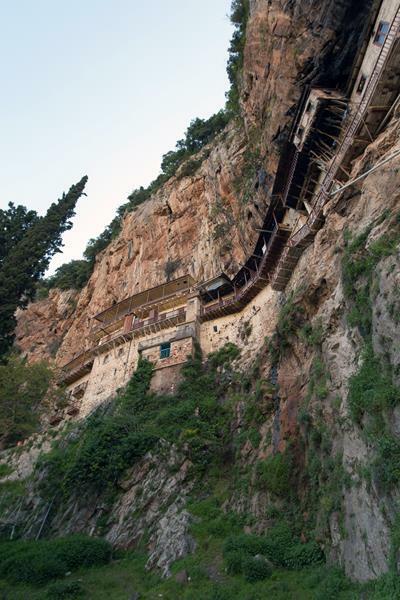 The position of the monastery, inaccessible to the crowds, was and is ideal for finding spiritual peace and strengthening. 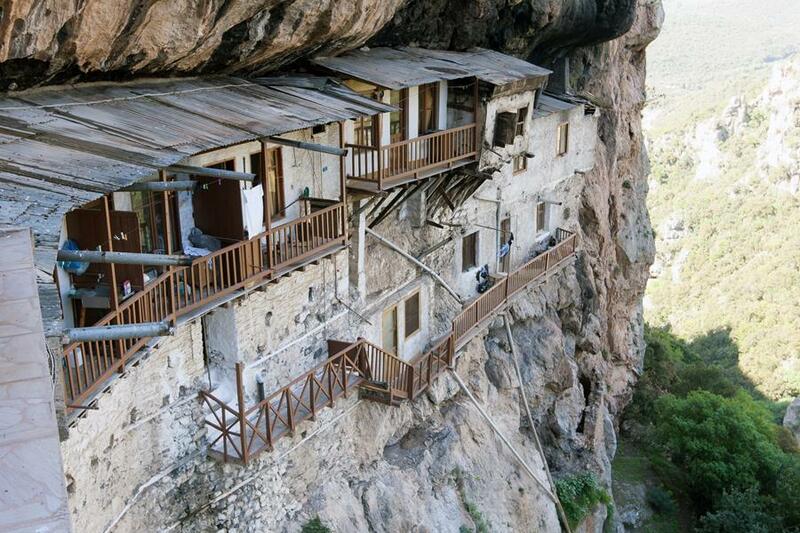 At the end of the 21st century the monastery numbered two monks. 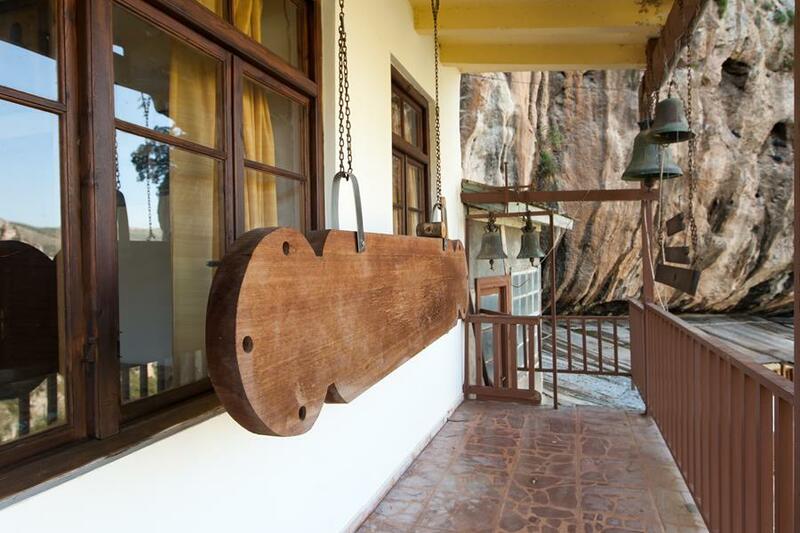 In the guest house, they offer coffee and sweets with the traditional hospitality. From the balcony the view is magical and unforgettable. 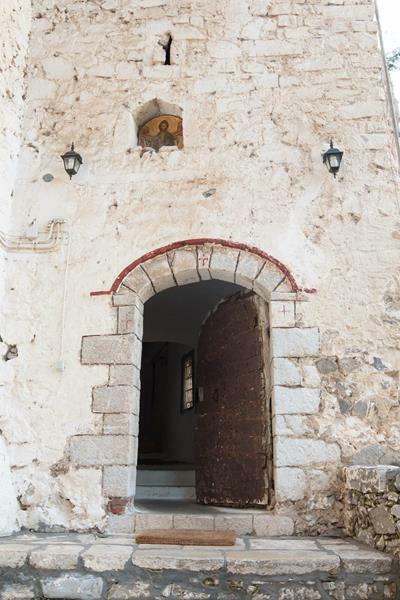 A tour of the broader region will enchant the visitor, allowing him to walk on the cobbled roads of Dimitsana, and to visit its library and castle. 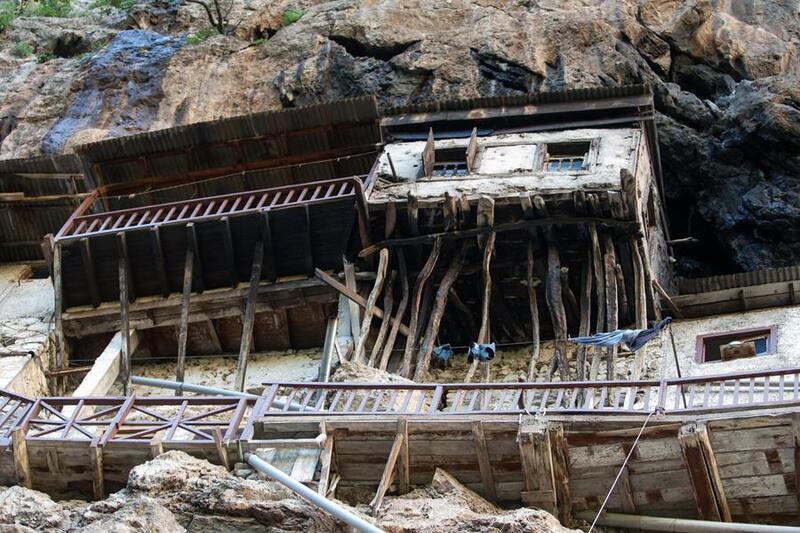 The hiker will find an idyllic route marked out for him, passing through Zygovisti, Stemnitsa, Zatouna, the traditional settlement of Vlongos with its panoramic view, Kalami, and the gunpowder mills, looking out on Klinitsa.